Software ini mempunyai ketangguhan dalam melakukan Proses Mastering . 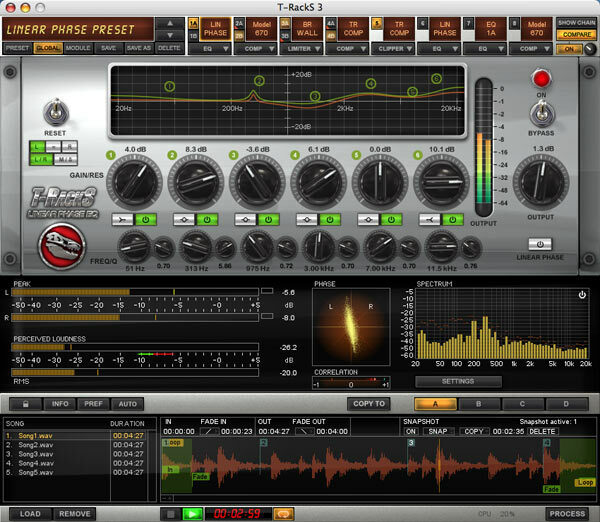 T-RackS 3 Delux raises the bar again in high-end DAW mastering and mixing, with a suite of 9 analog modeled and digital Dynamics/EQ processors, full metering suite, an audio quality that is unmatched in software, and scores of new and unique features. All processors and metering module can be combined within the plug-in/standalone suite or are also available as individual plug-ins for more convenient mixing within your DAW, for a truly complete bundle of 12 superior sounding tools (10 individual plug-ins, plug-in suite, standalone suite).